J’Accuse is an essayistic film in which Greenaway’s fierce criticism of today’s visual illiteracy is argued by means of a forensic search of Rembrandt’s Nightwatch. Greenaway explains the background, the context, the conspiracy, the murder and the motives of all its 34 painted characters who have conspired to kill for their combined self-advantage. Greenaway leads us through Rembrandt’s paintings into 17th century Amsterdam. He paints a world that is democratic in principle, but is almost entirely ruled by twelve families. The notion exists of these regents as charitable and compassionate beings. But reality was different. Greenaway points out to the viewer all sorts of ‘evidence’ that can be found in the Nightwatch, but which no one ever noticed before. Just as in the acclaimed American show CSI, Greenaway knows how to make the evidence for the murder credible by basing his line of questioning on the facts: historical sources, comparisons with other works of art that contain a secret message and mainly by highlighting numerous details in the painting that were never noticed before or that were simply not correctly interpreted. 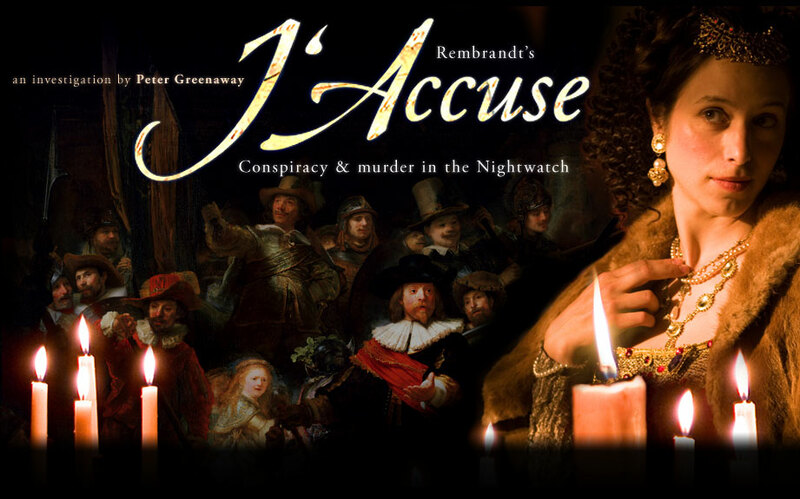 The film explains how and why The Nightwatch, Rembrandt’s J’Accuse, is a criticism of Amsterdam’s oligarchy and plutocracy of the Golden Age, a demonstration of the manipulative power of the visual image, and an indictment, which puts all the characters involved in a complex and devious conspiracy to murder. Greenaway himself plays the part of the public prosecutor, but is at the same time himself. In his 21st Century clothes he will interrogate characters from the movie Nightwatching, dressed in historical costumes on their part in the murder conspiracy.